How do I add a link to my smart liability waiver in an email or on my website? How do I add a link to my waiver on my website or in an email? How do I add my waiver to my social media pages? How do I add the Waiver Widget to a Single WordPress Page? How do I create a web button for my website? How do I install the Waiver Widget Plugin to my WordPress website? Is a signed waiver considered a valid document if the participant does not complete email verification? Once your smart waiver is published you can share the link to the waiver on your website, social media pages and in an email so that participants can sign before they arrive to their activity. 1. Be sure you are logged in to your account. 2. Go to the Email Link Generator. 3. 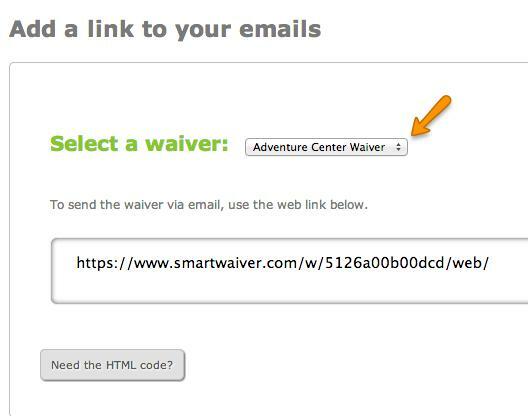 Select the waiver you'd like to use and then copy and paste the web link presented in the box. How do I share my smart waiver on my social media pages?